The tub conversion services provided by MR. FIX-IT™ for Richmond, Virginia, homeowners are ideal for anyone who wants to add a shower to their tub enclosure or remove their tub entirely. Since 1970, we have been providing homeowners throughout the state with premium home remodeling services, including a wide range of possible bathroom renovations. Our tub conversion services are designed to let homeowners dramatically change the look and function of their bathrooms in a single easy step. A new shower will not only expedite bathing and help to change how you use your bathroom, it can also refresh and update the visual appeal of your space without resorting to a complete remodel. Plus, when you call on us for our shower to tub conversion services, you’ll be able to choose from a variety of colors and options to ensure that your home’s new shower is uniquely yours. 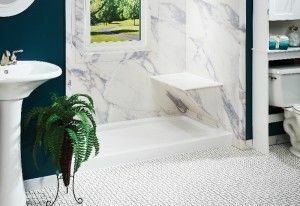 From custom options like recessed soap dishes, built-in caddies, shower seats, and foot pedestals, to stunning colors like sandshell beige, platinum grey, and quarry topaz, your new shower will beautify your home for years to come. For more information about the tub conversion services we provide in Richmond, VA, contact MR. FIX-IT™ today.